By Khoumsalla and out of the Rampartt mare Merri Ramamirrah, Spirit Seeker is a 1991 bay gelding whose athleticism helped spur early interest in reining. 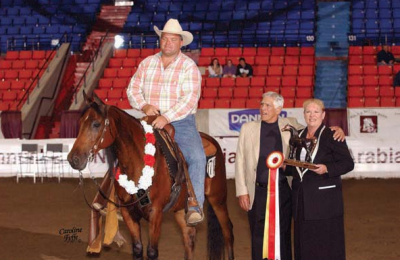 After earning multiple accolades at various regional championship shows, the Buckeye and Scottsdale, Spirit Seeker was named Champion at the 2004 Youth Nationals in the Freestyle Reining Exhibition for Juniors to Ride 14 – 17. That same year, he was Reserve Champion in the Arabian Reining Horse Championship class and Top Ten in Arabian Reining Horse Adult Amateur Owner Championship class at the U.S. Nationals.